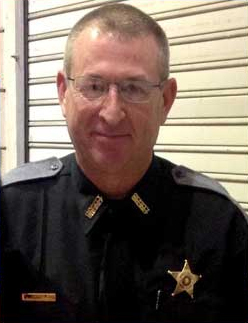 Deputy Sheriff Bart Hart was killed when his patrol car was struck head-on on Firetower Road, near Marshell Road in Wetumpka, at approximately 7:45 pm. He had just cleared the scene of another accident and was traveling south when the other vehicle crossed the center line at a high rate of speed and struck his patrol car. Despite wearing his seatbelt, Deputy Hart suffered fatal injuries. Three of the four 16-year-old occupants of the other car, including the driver, were killed in the crash. The fourth occupant suffered life-threatening injuries. Deputy Hart had served with the Elmore County Sheriff's Office for 2-1/2 years after retiring from the Montgomery Fire Department. He is survived by his wife and daughter.